Truly heroic efforts displayed by the LSU sophomores. Leaving their LSU jerseys at home, quarterback Brandon Harris and wide receiver Malachi Dupre both flashed Superman suits with a tremendous humanitarian effort this past Sunday night. The city of Baton Rouge has been absolutely slammed by torrential rain. Flooding has been a massive problem in correspondence with the monsoon-like conditions. Automobiles have been stuck in, and submerged under water as a result. On Sunday night, Harris and Dupre helped rescue a little boy and his mother out from a car submerged in water. The two LSU players even went into the car and recovered insulin for the boy, who is a diabetic. Head coach Les Miles spoke about the ordeal on Tuesday. It’s safe to say he’s incredibly proud of his players. 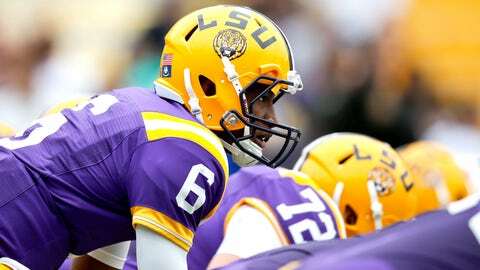 "That was Brandon Harris and Malachi Dupre doing good things on their own, without direction," said Miles. "In fact I’d have probably told them to stay out of the water. The truth of the matter is they knew better."